Roofing Insulation Starts With Insulfoam. Insulfoam offers the widest range of faced, laminated and standard high-performance EPS insulation products for all your new and re-roofing needs. With more than 60 years used nation-wide, Insulfoam Roof Insulations are a proven value. Our loyal customers have demonstrated significant material savings over other roofing rigid insulation products. Beyond material cost savings, and an enormous range of products to meet virtually any project need, Insulfoam Roof Insulations come with an available 100% R-Value warranty. Most other manufacturers only offer an 80% R-Value warranty – or less. These factors combine to offer a great competitive advantage for your business! Whatever your roofing system, Insulfoam Roofing products offer high value roof insulation products for your roof membrane assembly systems. Whether your membrane is black (EPDM, ballasted) or white (PVC, TPO, White EPDM) Insulfoam Roof products are compatible with both dark- and light- colored single ply membranes for the ultimate in energy efficiency. Available in custom sized panels and blocks, for ease of material handling and in widths up to 4′, lengths up to 16′ and thicknesses up to 40″, Insulfoam Roof Insulation products are available in nominal compressive strengths of 10-60 psi. Customize a huge breadth of insulation properties to create a high-performance, yet economical insulation for your roofing system. Application: All roofing and reroofing applications. Tapered panels used for increasing slope for additional drainage. Characteristics: Available in compressive strengths from 10-60 psi, flat thicknesses of 1/2″ to 40″, and tapered start thicknesses of 1/8″ to a maximum thickness of 40″; multiple slopes available. Application: For recover applications, approved for use under single-ply roof systems without the use of a slip-sheet. Characteristics: 4’x8′ panels in thicknesses of 3/8″ – 1″. 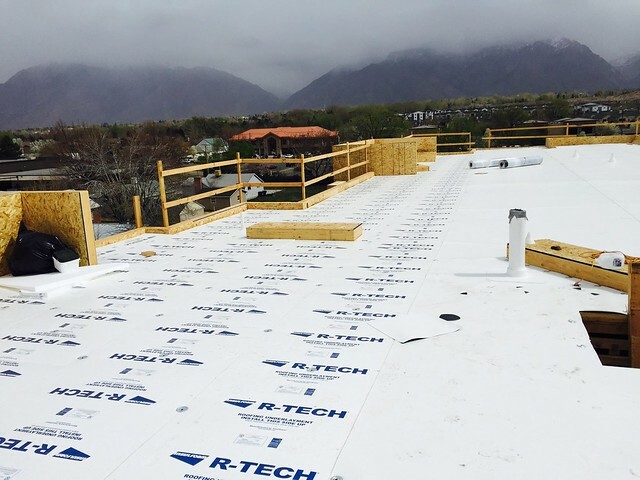 Application: For recover or new applications, approved for single-ply roof systems without an additional slip sheet on non-combustible decks. Characteristics: Available in thicknesses 1 1/2″ – 7″ in 4’x4′ or 4’x8′ panels. Application: For recover applications, approved for use under single-ply roof systems without the use of a slip-sheet. EPDM is acceptable in the Northern US. Characteristics: Available in lightweight 200 sq. ft. fanfold bundles with thicknesses of 3/8″, 1/2″, or 3/4″. Application: For new construction or recover applications, approved for single-ply roof systems. Characteristics: Available with 100 psi high density polyiso bonded to InsulFoam in compressive strengths from 10-60 psi, thicknesses of 1-1/2″ to 6″, in 4’x4′ or 4’x8′ panels. Application: Recover insulation for existing metal roof profiles. Characteristics: Available in taper, straight or custom-cut profiles to fit any metal roofing system. Application: High performance nail base insulation for use in commercial and residential roof applications. Characteristics: Standard substrates include OSB, Plywood, Gypsum and other cover boards. 4’x4′, 4’x8′ panels are available in thicknesses of 1-1/2″ – 7″. Also available vented as InsulVent. Application: For use in lightweight concrete systems. Characteristics: Typically provided in 2’x4′ panels in thicknesses from 3/4″ to 20″. Combine code compliance with economics and Insulfoam can help you offset project costs with material cost savings over other rigid insulations. Who doesn’t love lower total roof insulation system costs? View all Insulfoam Product Technical Bulletins for design and installation considerations here. You can always contact us or find a Representative near you. We are here to help make your insulation selection process easier! InsulRoof Resources – Everything You Need To Be An Insulfoam Loyalist! Continuous Insulation done right…. fewer gaps in wall insulation means better thermal performance. Insulfoam has impressive options for every ci need.